This is a fantastic summary of similar things that I’ve been speaking out about in blogs and at meetings of my city’s Bicycle Advisory Board. There seems to be a psychic blindness about Vehicular Bicycling — that cars and bikes should follow the same paths and patterns. I have been promoting an alternative called a Bicycle Topology, which would include Bicycle Boulevards, where low density and bike only ways interconnect but using a very different network than the car based road system. For a very low cost we could interconnect culs de sac, existing bikeways and low density streets with bike roadways and cuts and connectors. 1. Left turns: It is a negotiation. You can’t just force your way over like you would in a car, but at least one out of three drivers is fairly cooperative if you are communicating with head checks and hand signals. 2. There is a Pedestrian Left, using the crosswalks for a two step turn that is taught as an option, but generally unless you are in the most hostile of hostile situations, like in #1 there are cooperative drivers if you are communicating your intentions clearly. 3. Lane positioning comes in to play here. That said, a blind corner on an uphill slope might be a reason to avoid the route. 4. This is the reason for vehicular cycling. Ride in the lane like a car and don’t ride in the gutter. If you are riding where there is debris, you aren’t riding vehicularly. 5. Hand signals, head-checks, and patience are required. Car drivers can’t always “force” their way in either without causing a collision. Thankfully, some drivers are cooperative. 6. Don’t overtake a truck from the rear on the right. Be cautious of trucks on your left when approaching intersections. Otherwise, they are better trained and more alert than most soccer moms. 7. How about electric assist bike? Over time, muscles will grow and you can do 18 mph in street clothes on a city bike. How about selecting non-arterial streets with lower speeds? Vehicular cycling does require higher speeds. If you can’t pedal faster than 8 mph, vehicular cycling might not be the best option unless you stick to really quiet streets. 8. Pleasant, yes. Until one of you tries to dodge a pothole and hits the other one. Or until one of you says to turn Right and turns left instead and causes a crash. 9. If there are other cars at the stop sign, I sure hope you stop! That said, I do like to bicycle in Idaho. 10. This doesn’t show up as a high cause of bicycle crashes. 11. This also doesn’t show up as a high risk in the statistics. 12. Multi-lane roundabouts don’t show up at all in the bicycle crash statistics. It sounds like you want to combine very slow riding with Vehicular Cycling techniques. If you can’t do at least 15 mph in 35 mph traffic or 20 mph in 40 mph traffic, I think you are mis-applying the techniques. As the speed differential increases, even with car vs. car crashes, the crash rate increases. This is why some roads have both a maximum and a minimum speed limit. Similarly traveling at 15 mph on a sidewalk, where only 4 mph pedestrians are expected, is very dangerous when you look at the crash statistics. I’d suggest an electric assist if you want to do VC techniques without getting sweaty. Regarding point 4 – there can be debris or stopped cars in the right lane, not just a bike lane. In general, my point is precisely that for a reasonable, comfortable speed on an upright city bike (with cargo, kids, etc. ), vehicular cycling does not work well on busy high-speed roads. And in places built up in the post-war era, it may not be an option to take other streets, as they don’t go anywhere. Sidewalks can be a decent option, but not where they are littered with driveways, filled with many pedestrians, or have many intersecting streets. I think electric assist is better viewed as a way to battle large loads and hills, not as a way to go faster in general. Plus it’s expensive and adds complexity to a bike. Personally I would not feel comfortable going 30 km/h (20 mph) without a cage, electric assist or not. Ultimately I am saying that until we have good segregated cycling paths and intersection infrastructure, cycling mode share is not going to increase much. Thanks for the chance to have a dialog. Have you taken a League of American Bicyclists class like the Smart Cycling Traffic Skills 101 or the old Road I & II courses? After I learned good bicycle handling techniques from those classes, I became a lot more comfortable with bicycling at higher speeds. I haven’t taken any courses, though I will seriously consider it. My current strategies are to take quieter routes when possible, to take the lane when necessary, and to use the sidewalk with caution at driveways/intersections. But I think my best one is to have a freakin’ huge upright Dutch bike with a box and panniers that I ride assertively (or try to). Have you read John Forester’s Effective Cycling or John Franklin’s Cyclecraft? Or have you watched the video called Cycling in the Netherlands 1950’s showing such things as a group of nuns making left turns from the center of the street? Or have you watched the videos made by two League Certified Instructors riding on Southern California arterials? These videos show graphically that one does not have to ride fast in order to be treated as just another driver. Please take the time and effort to understand what it means to ride a bicycle as the driver of a vehicle before dismissing the practice. I can’t believe that Bob Shanteau is seriously comparing the urban streets in the Cycling in the Netherlands 1950’s video with cycling on 6+ lanes of Southern California. It’s such a gross, misleading simplification of the issue here. You can’t compare the freeways of California to urban streets in the Netherlands. These 6+ lane freeways are awful places to bike. Being an ex-cycling instructor I’ve spent plenty a useless moment trying to convince students that they can bike on them. It’s a waste of time and is just putting them unnecessarily in close contact with speeding cars. Instead most of my students would have gladly chosen those 1950s urban streets in NL. Even in the Netherlands the 50s was a tipping point beyond which cars began to clog the streets, shove cyclists out of the way, and cycling dropped off by quite a bit. People stopped cycling in no large part because it became awful. Cycling only started to recover when more separated cycling facilities were built and when streets were traffic calmed (turned into woonerfs). 6+ lane Socal freeways may very well be awful places to ride, but since bicycles are not allowed there, that’s irrelevant. 6+ lane Socal arterials are something else again, and this is what we’re talking about. The fear of riding on these roads is unfounded, as this video demonstrates. It’s not only safe and comfortable to ride on these roads, it’s about as boring as bicycling can get. Bob, I’ve taught cycling courses for years to many students. I’ve also biked on many arterials, from the clogged stop-and-go variety downtown to the fast 6+ lanes of suburban arterials. Despite your best efforts you’re not going to convince me or the vast majority of people that these suburban “highway” arterials were designed for anything other than optimizing fast motorized traffic. People on bicycles are just interlocutors who are just barely tolerated at best. Even after taking students onto a “highway” arterial very few of them will willingly go back. And these are the ones that have received the highest training available. Good luck trying to convince the rest of them. Even aside from the complete lack of comfort, taking the lane on the “highway” arterial is risky, considering the relatively high speed of motorized traffic. It seems to be mainly the Cycling Savvy folk who seem to be promoting this behaviour. When I took my students out onto our closest equivalent to the SoCal speedways, I advised them to stay 1/3 metre from the road edge. I was following the CAN-BIKE curriculum, which says that the difference in speed is too great to safely take the lane. Some vehicles may not have enough time to change lanes in time. (Even less likely when it’s dark or icy.) Ontario’s MTO guide says: “On high-speed roads, it is not safe to take the whole lane” (http://www.mto.gov.on.ca/english/pubs/cycling-guide/section3.0.shtml). BikeSense in British Columbia agrees (http://www.bikesense.bc.ca/ch4.htm). Cycling Savvy makes some claims about safety yet we have to take them on faith only. Meanwhile other cycling education programs haven’t followed this extreme position. I’m all for cycling education in our schools. But I’m also for great, Dutch-style cycling infrastructure in our cities. You can keep the highways to yourselves. The closest I’m seeing without a lot of searching is Rochester NY. Some of the bike clubs are closer to you and they might have classes or ride leaders who can help you. A lot of VC is showing confidence and communicating your intentions through body language and lane positioning, but the classes give you good information on crash statistics, practice with different bicycle handling techniques, discussion of the laws and even tips on clothing and nutrition. I believe a rough equivalent here is the CAN-BIKE program. Yes. Can-Bike-1 and Can-Bike-2 combined look like the equivalent of what I was recommending. Summary, to ride vehicularly, you need to possess common sense and have some mediocre level of fitness (and less with electric assist). 1. Cars and trucks block the left lane to turn left all the time. 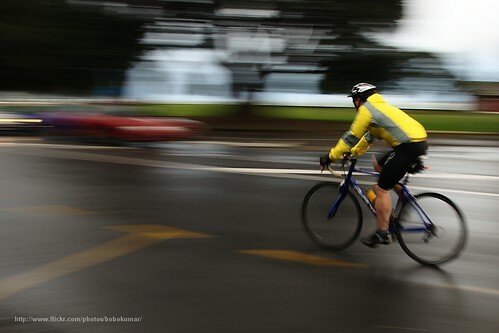 At low speeds, bicycles can accelerate faster than cars, so one can actually cross two lanes faster than a car can. 2. See (1). Drivers have to wait just as long for the break in traffic. 3. This is your only legit point. And you can almost always choose a route that avoids this case. 4. Ride in the lane and look ahead for obstacles. Good news about riding a bicycle vs a car, is it’s much easier to dodge, and if you’re really desperate, you can bail onto the shoulder or sidewalk. 5. Heavy traffic isn’t a big deal, because heavy often means slow. Signal and wait for someone to let you in. High-speed can be intimidating, but route selection can help here. 6. Don’t put yourself in a position where they cannot see you. 7. What’s wrong with riding faster? I routinely bike hard and go to formal events after.. you can wipe yourself down quickly and change from a t-shirt to a nicer shirt. 8. Riding two abreast is a very effective way to ride vehicularly and claim the lane. 9. What’s the big deal? Law says you should stop. So stop. Or roll the stop, and risk a ticket. Cars speed and roll stops and risk tickets all the time. 10. So don’t stand at the left edge of the left lane. 11. I’ve never seen this situation listed in a peer-reviewed study of bicycle accidents. There’s at least another dozen situations that are more frequent. I’ve already mentioned above about riding fast. It just is not compatible with what should be a totally mundane scenario of a mother with a child or two and some groceries on a bike. European-style upright city bikes are designed for cargo and comfort, not for speed, and this is the sort of bike that you need for people to be able to ride in order to increase mode share. Needing a change of clothes in order to cycle is a big hurdle for most people — it doesn’t make cycling worth it on a regular basis. Regarding point 12 – I live in Waterloo Region, Ontario, which is constructing roundabouts at many intersections of arterial roads. Cars don’t have too many problems with them, and in fact they decrease serious accidents. In most North American suburban areas, you really can’t avoid using the arterials if you want to get somewhere. I should say that cyclists can still navigate roundabouts the pedestrian way. As a transportation cyclist for almost 20 years, I practice vehicular cycling while riding my cargo trike as I get around town on my errands. I don’t agree that speed is a necessary factor for utility cyclists to practice vehicular cycling. I’m 68 and carry some heavy loads including hauling a heavy cargo trailer. My average speed around town is about 14.5 kph. My speed can be as low as 8 kph when I’m doing some heavy pulling. Lane control and visibility are bigger factors. It is fun but it made me gain weight, so I think I’ll save it for when I get old :-). Effective Cycling by J Forester and got a new awareness as I practiced what I read. I understand Cyclecraft(NA version)by John Franklin is good too. Based on what I can tell from Google Maps, Peterborough is a place with a big street grid and even pretty reasonable arterials. I don’t doubt that vehicular cycling can work fine there. In Kitchener-Waterloo some of the post-war suburban arterials are treated as highways, and I don’t think you would want to ride on those at 15 km/h. K-W has grown significantly in the car age, including widening of older streets. So a rather large percentage of the place is inhospitable to mild-mannered casual utility cycling on the roads, especially by those new to it. Someone posted a link to your blog on a Seattle cycling site….. Some of our incredulousness is more I think from the situations being rather different. In a small town that is quite flat (from google earth’s street view Waterloo looks pretty darn flat?) an Amsterdam type system could work fine – as long as *motorists* can be trained to respect it…. Here in the US one of the worst places for accidents is where roads and sidewalks/trails intersect, so a separated bikeway worries me, but if motorists expected and could be counted on to be *careful* when turning or crossing the bikeway it could work. Cycle tracks absolutely need careful treatment at intersections. The infrastructure should ensure clear interaction, e.g. through raised and visible crossings, colored guideways, bike signals, bike boxes, or even clear merges into the road. This presentation on cycle tracks for Portland highlights intersection issues and how to address them. Yep, it’s reasonably flat here, so cycling isn’t too onerous. But I would suggest that if you have people cycling for utility already (and I am sure you do), you would have more if you made the streets more attractive for it. As for the heavy utility bikes (not that they have to be heavy), put an eight-speed on them and many hills become doable. In fact, mine actually came from Dutch Bike Seattle…. While I agree with you that for some populations and in some areas vehicular cycling may not be possible, I live in Los Angeles, where the speed limit on almost all surface roads is 35mph. I can easily get up to 26mph without breaking much of a sweat. Not that I need to go that fast most of the time. The way car traffic is here, I can practice vehicular cycling around 18mph. I wasn’t always this way though, when I first started cycling, I was much slower, and I did opt for sidewalks or pedestrian left crosses. But the more comfortable I became with cycling, and the more fit, and faster, I am now very comfortable negotiating traffic and taking the lane. I use hand signals as often as possible, and make turns from the left turn lane with no problem. At streets where there is no left turn lane, I pull into the cross street and line myself up to go across with traffic when the light changes. You’re right that vehicular cycling isn’t for everyone, BUT the idea that we all get sweaty to do it is flawed and the idea that it has to be either or is also flawed. Perhaps instead of knocking it, you could suggest ways cyclists can be more comfortable riding in traffic, as not all roads have bike lanes (in fact most don’t) and sidewalks aren’t good options if you’re going over 10mph. At some point on their route, all cyclists have use the street, so we all need to understand the fundamentals of vehicular cycling and how to be part of traffic. I like your list of 12 and agree that they are some of the reasons we need improved bicycle facilities. Your over all premise is the main reason I like it though: the goal for many of us isn’t improvments for individual riders, which many of the comments seem to address, but rather an improved network for all kinds of bicyclists. From the athletic recreational cyclists, to the mother of two who wants to drop the children off via a Dutch cargo bike. For myself, as a former bike courier in a major city, I have no problem navigating with traffic. However, I don’t always wish to ride like that. At times, I break out the cruiser and just want to get somewhere in a safe, comfortable manner. Even then, I need to use my skills of being a vehicular cyclist, and we all should have some of those skills, but we need to recognize that there is a difference between the modes and embrace, and ask for, some perks of being a clean form of transport. We can use the whole lane, the bike lane or the path as we choose because we’re special. Improved traffic infrastructure, facilities and policies, like segregated pathways, but also things like sharrows can go a long way in communicating that a community values all modes of transportation. As part of a network plan, this has proven to increase the number of bicyclists. And, it helps us make better communities. Wow Michael, you seem to have hit a nerve there, good job! I think the biggest tension between the pro and anti v-c people are that each thinks that the other will hinder their chances at being successful at improving cycling. Traffic laws were created with cars in mind, and as-such provide some discomfort for cyclists. VC proponents see this as a problem as well, but try to work “within the system” and improve the traffic laws. They often fear (as happened in the 70s in the U.S) that Amsterdam style cycle tracks will come hand-in-hand with even poorer traffic laws for cyclists. I think that both sides are a little paranoid. I believe it’s possible to convince planners to install cycling infrastructure on arterial roads *and* at the same time convince lawmakers to institute laws like the 3-foot-passing law. Some people gravitate to one fight or the other, and if each would just let the other be, both groups might be more successful. As far as your concerns go, you will find that with experience, they are mostly unjustified (with the exception of the blind-corner). It’s not speed that calms those fears but experience. There is a third group of us that believe the systematic dismantling of childhood cycling has done as much damage to that mode of transportation as anything. People grow up and try to pilot a car without ever spending significant time on a bicycle (or as a pedestrian for that matter.) It’s no surprise that motorists struggle with understanding the needs of cyclists and are terrified of going without their steel cage. This was presented at my Bicycle Advisory Board meeting last night. It is from a study in Portland — a premier bicycling city — about the “4 Types of Cyclists”. What it says basically is that the majority group, 60 percent, are people who bike and want to bike more, but who do not want to be in a bike lane or anywhere near traffic! Given those figures, all the current efforts to build urban vehicular bicycling infrastructure are completely misguided. Ah, those Portland numbers. They are not based on any data. Portland bicycle coordinator Roger Geller simply made them up. If you think about it, you will see that no universal statement can be made about this, because the percentage of different types of cyclists depends heavily on their training, and the environment in which they ride. This is not to say that some people aren’t more likely than others to ride, it’s just to say that putting out numbers as if they were conclusive and based on actual research, when they are merely someone’s guess, does not contribute in a veyr helpful way to the discussion. Good post and I agree with you. There are a lot of people for whom “just ride faster so you can keep up with traffic” isn’t ever going to work. I’d love to see more people like that on the roads, but they’re just not going to feel comfortable jumping into that kind of mix, no matter what education they have. Education is one thing, biking with your kids and your groceries at 12mph in front of multi-ton vehicles who want to go 40 mph is another. I personally ride VC style most of the time, and while I can say that the technique of holding a commanding lane position does really work, it’s exhausting mentally and sometimes physically, as I feel like part of what makes it successful is being able to keep up a moderate traffic speed. This is often overlooked by its practitioners, who almost by definition are experienced and strong riders. Even though I’m a pretty strong rider who’s been doing it for years, there are lots of days, if I’m sick or hurt, or just not feeling it, it’s too much, and I’ll take the MUP. Many people don’t have that option, and beginners probably always feel that way, especially as they’re building up fitness and traffic confidence. While no-one wants a glut of poorly designed bikeways, I think we have to start somewhere on infrastructure, and in tandem with more education for both drivers and pedestrians we can achieve more people taking more trips more comfortably by bicycle. The multi-lane roundabout is an interesting quandry. They’re rare in the US, but we have a couple in Cambridge (MA). In the particular ones I’m thinking of, there’s an off street bicycle facility with twin user-demand crosswalks with lights, parallel to the two roundabouts, so I just take that most of the time. It’s an infrastructure solution to what is a real problem. If I had to ride through one, I’d be very very aggressive in taking the lane, and my head would be on a constant swivel. To their credit, they’re a bit scary to drivers too, which means they’re more likely to be looking and see you. Late reply, I’m wondering what people think about my approach. I live in Atlanta, not a bike friendly city (we have some bike paths, usually not useful for communiting purposes, and bike “lanes” which look like they are being installed to get some federal dollars but don’t show much awareness or concern about actual bicyclists using them (i.e. rough pavement, bad grates etc), not to mention the “too close to fast traffic” issue. It’s also hilly and HOT but I have an athletic club at my office where I can shower and change. I have lived within a few miles of my job for decades, but have rarely ridden to work because of the safety concerns. I’m getting geared up to try again, trying to identify a route that keeps me away from heavy fast traffic. One solution? The “pedestrian” mode mentioned above. My theory? A sidewalk with no or few walkers = a bike trail for me. I ride a mountain bike and can move from road to sidewalk if needed. Since we have recently added a lot of new sidewalks around town, they are often a better surface than the road, and have adequate curb cuts etc. In heavy traffic I also use pedestrian crosswalks rather than try to cut across lanes to get into turn lanes. Maybe it’s not legal, but until the city or private foundations can provide reasonable alternatives, I say let them ticket me (not likely, really). And yes, I show courtesy to actual pedestrians and don’t run them down. I think it’s a fine solution (and often use it myself), but you do need to exercise caution and not treat it as a safe zone. The reason cyclists vilify sidewalk riding is that it can be very dangerous — drivers do not expect fast-moving traffic on the sidewalk. So you should be alert at driveways to cars that may be trying to turn out of or in to those driveways (especially when they’re preoccupied with turning left across traffic). Similarly drivers may not expect you at a crosswalk, so you should go slowly and make eye contact; honestly I’d say the same goes for walking as well. If you’re moving over to the roadway, be very careful that drivers see you. Courtesy to pedestrians is a given, of course. So there you have it: defensive sidewalk cycling. as a club cyclist since 1973 & 1979 graduate of the effective cycling course i do not need convincing that vehicular cycling is the safest& best way to ride. So called “vehicular cycling” has proven to be a total failure at getting people out of their cars and on to bikes to lower congestion and stop the wasteful short journeys we make by car in English-speaking countries. The simple fact is that roads are too cluttered with fast moving motor vehicles to make cycling remotely attractive except to a tiny minority. No amount of “effective cycling courses” will change that. It is also why in those countries where vehicular cycling is encouraged and people are told to just get on a bike and share the road, the modal share of cycling is, and will remain, between 1 and 2%. John Bailo in his post above is totally right. This is like saying motorcycle safety courses have “proven to be a total failure at getting people out of their cars and on to motorcycles”. The purpose of “vehicular cycling” has never been to make motoring less popular or bicycling more popular. Vehicular cycling is a paradigm and set of techniques and practices that allows just about anyone to ride safely and comfortably in all kinds of traffic. In cities like Copenhagen, Amsterdam and Davis where segregated cycle facilities are often credited for “getting people out of their cars and on to bikes”, many seem to forget that bicycle use was already at least as high as it is today before any of the facilities were introduced. To credit the facilities for much if any of the high use of bikes is completely unfounded. What works in terms of getting people out of cars and on to bikes is flat terrain, high density (short average trips) coupled with government policy that discourages motoring via high vehicle taxes, high gas taxes, and greatly limited and very expensive parking. Without flat terrain, high density and anti-motoring policy, no matter what you do with facilities or vehicular cycling advocacy, not much is going to change. But with flat terrain, high density and anti-motoring policy, no matter what you do or don’t with facilities or vehicular cycling advocacy, you will have a lot of people on bikes and out of cars. This is how it was in Amsterdam, Copenhagen and Davis before any segregated facilities were built. As far as I know, Portland’s investments in cycling have focused on infrastructure, and not on changing its geography. Yet somehow they’ve seen some dramatic increases. If it were simply about the difficulty of driving and parking, there would be a corresponding increase in transit use — but there hasn’t been, because Portland hasn’t made driving more difficult. Most importantly, regardless of what factors are responsible for these increases in bike modal use, the net effect is still pretty minor. To compare, Davis, in the early 1960s, prior to the introduction of any segregated infrastructure, achieved its peak bicycle modal share of around 25%. The cause? Almost certainly the closure of the UC Davis campus to motoring (that is, policy that inhibits motoring). So even if infrastructure can spark some increases in bike modal use, at best the effect can be only very modest, and even approaching negligible, relative to what discouraging motoring can accomplish. In the mean time, segregated infrastructure encourages segregation and segregated thinking – that bikes and cars should be separated, not integrated, which further discourages the practice and acceptance of operating a bicycle on roadways as a driver of a vehicle. Seems like a huge cost for a tiny benefit (if any) to me. Of course, those who make a living from the segregated infrastructure industry are likely to disagree. Lance Armstrong is the reason for cycling modal share going up dramatically in Portland, far above the increase in other cities (or in many cases, no change at all)? When the thing Portland has very clearly done is focus on cycling infrastructure? Not buying it. A much better argument would be that it’s due to the city bringing attention to cycling as an option, but that’s pretty weak. Of course the effect isn’t huge overall — the infrastructure is predominantly not physically separated from fast-moving traffic and it is not a complete network. Portland remains a city divided by grade-separated highways, and that is both an incentive to drive, and a disincentive to get around in other ways. Perhaps most importantly, Portland also includes much low-density sprawl, which is nowhere near bike friendly in its infrastructure or otherwise; the figures for the inner city would be quite different. I ride in plenty of different ways — low-speed city streets, sidewalks on occasion, multi-use paths, bike lanes on arterials, and arterials without bike lanes (staying well away from the curb). My experience on the latter is the kind that encourages me to drive instead. I have no interest in putting myself in the same space as cars going 60+ km/h. And no matter how much you convince or teach people, the vast majority of the general population will be in the same camp. With the amount of money being spent on streets and roads, segregated cycling infrastructure on major streets would be a drop in the bucket – especially when it’s part of a reconstruction. Is Lance Armstrong also responsible for the 24% increase in cyclists on the Burrard Bridge after Vancouver added separated cycling infrastructure? How about the 400% increase in cyclists on Dunsmuir Street? Well, there is no question that most people prefer to not mix it up with cars when given a choice. But I do think it’s possible for most people to cross the threshold from finding riding in traffic to be unacceptable to being safe and comfortable. It’s mostly about a mental paradigm shift, but there is specific training involved too. Sylvan, of course Lance Armstrong cannot be credited for shifting cycling volumes from one route to another when new facilities are created. But changes in cyclist volumes along one particular route is not relevant to seeing how much infrastructure lures people from motoring to bicycling; only looking at total bike modal use does that, and even there isolating the effect of infrastructure is often very difficult if not impossible. So let me get this straight. Building separated cycling infrastructure makes the route with the separated bike lanes attractive enough to draw cyclists from other routes, but doesn’t increase the number of cyclists overall. When the creation of cycling infrastructure is accompanied by an increase in the overall cycling rate, the increase in cycling is actually caused by other factors like Lance Armstrong, and is not related to the infrastructure investment. I think I get the picture. Right. There is a big difference between attracting existing cyclists from one route to another route by creating a path of less (motorist) resistance, if you will, vs. attracting people from motoring to bicycling. But, again, even if infrastructure can make apparently huge gains where modal share is very low (going from 1% to 4% is a 400% increase), I suggest it’s easy to overlook the cost of those gains and how small they are in terms of making real progress towards having bicycling be a significant modal share. There is evidence, like in Davis, that once you get to a certain modal share (and that may be as low as 5% or lower), adding more infrastructure does nothing to help increase modal share even more, and might even be counter-productive. The facilities industry is unwilling to admit it, understandably, but segregated facilities have very little if any effect on actually getting significant numbers to take up bicycling instead of motoring, and even less with making bicycling safer. Members of groups who are discriminated against are often subject to accepting some of the biased views themselves. Bicyclists are no exception to this, and the key to vehicular cycling is not just learning to follow the rules, but getting over anti-cyclist bias. There exists a biased view that because “bicycles are slower, much smaller, quieter, and generally less visible than are cars”, bicyclists have an obligation to stay out of the way of cars. This is inaccurate from both legal and safety perspectives, but it’s also a debilitating view, because holding it makes acting like a driver of a vehicle while bicycling practically impossible. Others have correctly noted that learning to negotiate for right of way, one lane at a time, across multiple lanes of fast moving traffic is how you address the left turn challenges (for example) noted in 1 and 2, but that can’t be understood and appreciated, much less practiced, by someone whose priority is staying out of the way of same-direction car traffic. As for 4, obstacles in the right lane, debris collects in shoulders, gutters and bike lanes because of the constant and continuous sweeping effect of motor traffic. Pavement upon which motor vehicles travel is constantly being swept clean, and all the debris gets swept into the adjacent shoulders and bike lanes. Even once-a-week bike lane street sweeping could not come close to competing to the wonderful sweeping service provided by motor traffic for traffic. Someone who rarely rides on the pavement that is constantly swept clean might not be aware of the dramatic difference. The idea that you have to be a fast rider to practice vehicular cycling is also incorrect, and likely stems from inappropriately applying “freeway mentality” (“everyone should travel at ‘the speed of traffic'”) to surface streets. Surface streets have all kinds of factors that make them different from freeways, including… traffic controls, drivers entering and exiting the roadway, people slowing, stopping and reversing to park at the curb, vehicles of all shapes, sizes and speeds, pedestrians crossing, etc. Bicyclists are just part of the mix, including bicyclists controlling lanes. It really works much better than most imagine (imagine without trying). There’s plenty of good footage on Commute Orlando, showing female cyclists, who are not fast, riding at a comfortable pace as drivers in traffic. The 12 objections listed above are complaints that competent bicycle driving instruction more than adequately addresses. Just look at the CyclistLorax and CommuteOrlando channels on YouTube to see how bicycles can be driven in traffic, as this is the most sustainable approach to bicycling. Why? Because it uses existing infrastructure. No need for more asphalt, special traffic controls and the associated costs for recurring sweeping, etc., or the political battles one has to fight to change infrastructure. Just go out there and drive! Education is the best, the safest and the cheapest bike facility. So called “vehicular cycling” has proven to be a total failure at getting people out of their cars and on to bikes to lower congestion and stop the wasteful short journeys we make by car in English-speaking countries. I spoke too soon earlier. Turns out training of bicyclists has been proven to be effective at promoting cycling. Cycle Training UK Ltd 1998-2003.  81% of trainees cycle more or more confidently now than they did before training. training, and average journeys of 3-5 miles are up by 79%.  The number of bike trips people make is up by 144% (from 0.9 to 2.2 trips per week).  The number of people cycling all year round is up by 40%. average up to just 2 hours of training. I always try to encourage cyclists to stay off the sidewalks, unless I don’t. There’s definitely situations where you are taking undue risk by being in traffic. To me, VC is a kind of false security. Experience counts for nothing. You are always relying on the motorist to be paying attention and to actually see you. I prefer to take more charge of my safety. I prefer to make it immaterial whether I’m seen or not. Further, a militant stance on VC can be counterproductive to getting people out of their cars. If you preach that VC is the way to safe cycling, most urban commuters will give up before they even consider it. You are always relying on the motorist to be paying attention and to actually see you. I don’t understand why so many people seem to associate this assumption with VC. I don’t rely on motorists to be paying attention and actually seeing me when driving my bicycle in traffic any more than I do when driving a car or motorcycle; that is, I don’t at all. First of all, the vast majority in traffic don’t need to see me because our paths will not cross, so I don’t worry about them at all. At any given time, there is often no one with whom I have a potential conflict in the next few seconds, but, when there is, it’s probably just one or two, and that’s where most of my attention is (actually, my attention is given there before we get to that point). Yes, once I know I have been noticed (and eye contact alone is not evidence of that!) I do depend on being seen and not hit. It’s not different than when having to slow down while on a motorcycle for a red light or some kind of obstruction. The alternative is to ride completely outside of traffic, which is debilitating when volume and speed is significant at all. It makes cycling in traffic practically impossible. A militant stance on just about anything is counterproductive in terms of popularizing that something. That doesn’t justify mischaracterizing the something, for example, by saying that merely being in traffic sometimes is “taking undue risk”. We’re talking about urban surface streets here, not freeways. Not sure I follow the last paragraph there Serge. The point is, that there are times when you are safer out of traffic. For someone to argue that at all times traffic is the safe place to be doesn’t make sense to me. I disagree with you also that you don’t rely on the motorist to see you. Have you ever seen a rear-end collision? If a motorist can miss a 2 ton car right in front of them, then one day they will miss seeing me too. Except, when I’m on a bike, it’s a much more severe penalty. Even a motorcycle is a significantly larger target than a cyclist. I didn’t say you’re more safe when in traffic than when not in traffic. I said you’re not assuming “undue risk” when in traffic. But if we’re talking about relative safety, you’re even safer home on the couch, by the way. So what? But yes, if you’re following the rules, paying attention, looking out for others making errors, being out in traffic is “safe” by any reasonable use of the term. As for rear-enders, the car-car type occurs most frequently in stop-n-go traffic when someone is not paying attention. I generally don’t find myself in that type of traffic (when it’s that slow I filter forward one way or another). As far as the general risk of being hit from behind in non stop-n-go traffic, which is extremely low, I use a conspicuous roadway position and a rear view mirror. By being conspicuous, I can determine in my mirror whether I’ve been noticed or not long before it’s too late to bail or whatever. There is risk out there, of course, but most of it can be mitigated to a point that we must be able to tolerate. The risk of taking a bath, getting on an airplane, going for a dip or even drinking a glass of water is not zero, but we engage in all of these activities none-the-less, hopefully taking due care. Bicycling, safely, in traffic is no different. Having said that, there are certain situations where it might be so dangerous that I would get off the road out of traffic. But that’s only when visibility conditions are extremely poor due dense fog, smoke or dust, in which I can’t do anything to verify whether I’ve been noticed or not. Even riding into a blinding sun is not that bad, because there I can see behind me in my mirror to see if I’ve been noticed. UK sociologist Dr. Dave Horton has recently published this excellent piece about the fear of cycling. He explains how advocacy for separation, as is espoused here in “12 reasons vehicular cycling is not enough”, contributes to exaggerating that fear. It’s a well-researched professional paper that should be read and carefully considered by anyone interested in cycling safety and advocacy. I would say bike lines are generally not useful, but fully separated paths (can be shared with pedestrians) can be. These are places in K-W where I’ve biked before and think they would be useful. A lot of these are somewhat freeway like suburban arterials with high speeds (60km/h limits usually, most going at 70km/h and 80km/h not uncommon) and few alternate routes, and sometimes long slopes that would slow down a cyclist to 10-15km/h. On streets like these, vehicular cycling should work fine for most people. From my observations, these kinds of streets tend to have a decent amount of cyclists, including casual ones, even in the suburban autocentric neighbourhoods. The suburban arterials on the other hand have very few cyclists.